Welcome to the Underground! Small World Underground is a new stand-alone game set beneath the surface of the same fun, light-hearted Small World universe of epic conquests and fallen empires. Designed by original Small World author, Philippe Keyaerts, it features all new Races and Special Powers, and introduces Monster occupied regions that protect Relics and Places of great power! Small World Underground includes all new subterranean maps featuring new terrain types and geographical challenges. While Small World Underground is a complete game that can be played on its own, you can also combine the game with many Small World game elements from the original version or expansions. Experienced Small World players will find that venturing beneath the surface makes the game more tactical than ever! 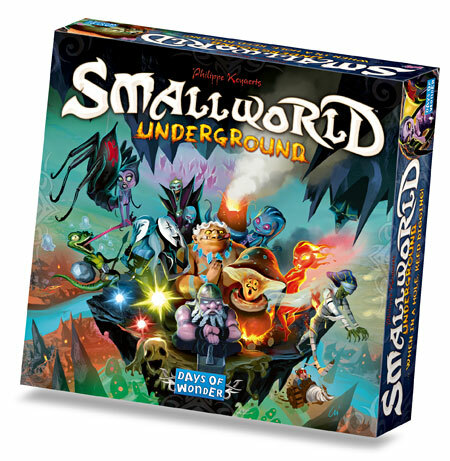 Small World Underground is for 2-5 players and will be available in Europe in June and in North America in July at a retail price of €45 or $50. Learn more at the Small World Underground web page. This entry was posted on Thursday, April 28th, 2011 at 14:21 and is filed under Games, News, Small World. You can follow any responses to this entry through the RSS 2.0 feed. Both comments and pings are currently closed. AAAAAaaaah I can’t wait for this one! IT looks amazing. AND it’ll be out just in time for my birthday 😉 Yay days of wonder! Did you design the insert to have room for the upcoming expansions? The insert will be chockfull just fitting in the pieces that come with the game. This is great! I like the box art a lot too. That is not correct. I will, and so will many others. I suspect a majority of the initial buyers will be owners of the original. I think, you aren’t right. I have base game and all expansions and already want to buy Underground. I have several friends who will get this!! They’ll probably even pre-order it to enjoy during the summer. I think DoW will have no problem with people wanting this game as well as the original! wow, looks cool, great work! If you enjoy playing smallworld then i’m quite sure you will enjoy the new version just as much. I like the idea that there appears to be some new features and ideas to the game play so that it is not just a carbon copy of the original. The real question is just how well does it work with the original and expansions? If it’s as simple as plugging the new races and abilities (and other new stuff) into the old game, or vice-versa, then why doesn’t all the advertising say so? Clearly, I mean, with no ambiguity.